Struggling Kandahar Knights will lock horns with confident Paktia Panthers for the second match of the doubleheader Wednesday. Kandahar and Paktia will be meeting for the second time in the tournament. The last time they contested, Paktia Panthers won a close encounter by nine runs. Thus, with Paktia all set to continue their winning ways and Kandahar eager to get a place in the semis, the Kandahar-Paktia encounter is expected to be a close one. Kandahar Knights have had a sorry run at the tournament under the leadership of Ashgar Afghan. Knights have only one win from their previous six encounters which stands them at the bottom of the points table. However, Knights still possess a decent chance to enter the semis if they win their remaining two matches with a satisfactory margin. Kandahar Knights' batsmen have struggled considerably to get going in the tournament. Their batsmen have failed to chase the totals as low as 127 which speaks about their in-efficacious batting. Besides, no or little support from their overseas batsmen hasn't helped their cause. However, their bowling doesn't follow the same lines as their batting does. They have performed considerably well in their bowling department. Moreover, they have had a good variety of bowlers in their camp to support their bowling form. Thus, with semifinal hopes still alive, Kandahar will hope to reroute their form in today's game against Paktia Panthers. Probable Playing XI for Kandahar Knights: Paul Stirling, Karim Sadiq (WK), Brendon McCullum, Ashgar Afghan (C), Riki Wessels, Najibullah Zadran, Sayed Shirzad, Mohammad Naveed, Nasir Jamal, Karim Janat, and Waqar Salamkheil. Meanwhile, Paktia Panthers have blossomed in the tournament under the tutelage of Mohammad Shahzad. Panthers have already qualified for the semi-finals irrespective of the results of the remaining two games. Panthers have possessed one of the most powering batting lineups in the tournament. With the likes of Mohammad Shahzad, Cameron Delport, and Sikandar Raza, they have seared onto great heights in their batting department. Their bowling has followed the same trend. Panthers have performed brilliantly in the bowling department as well. With each player stepping up, their bowling looks destructive while going into the latter stages of the tournament. Thus, with an evenly poised unit, Panthers will look to continue their winnings with some excellent performances on offer for the cricket fans. 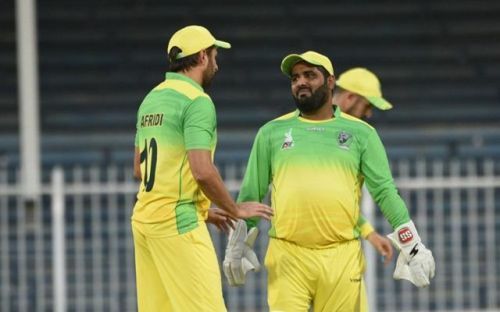 Probable Playing XI for Paktia Panthers: Mohammad Shahzad (C & WK), Ihsanullah Janat, Cameron Delport, Sikandar Raza, Samiullah Shenwari, Rahmanullah Gurbaz, Shahid Afridi, Sharafuddin Ashraf, Ziaw Rahman, Isuru Udana, and Yousuf Zazai. With nicely poised batting and bowling lineup, Paktia Panthers are expected to be too good a team to beat for Kandahar Knights in tonight's encounter. Panthers are in ominous form and will pose a tough competition to Kandahar Knights. Expected top performers for Kandahar Knights: Ashgar Afghan and Brendon McCullum. Expected top performers for Paktia Panthers: Mohammad Shahzad and Cameron Delport. Final Prediction: Paktia Panthers virtually ending Kandahar Knight's semifinal dreams.